Went up to London today to the Tate Britain. On the journey a woman across the passage of the carriage was intently reading, eyes down not registering the rest of the world. 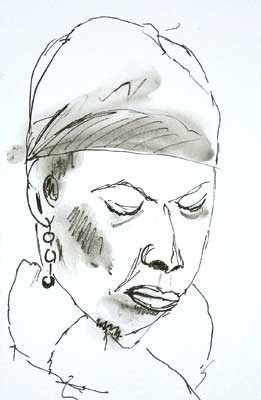 I know she looks as if she might be sleeping in my drawing but that was how she looked. While nothing special I am pleased with having done this is only a few minutes. No reference photo for obvious reasons. The visit to the Tate was to visit the new Millais exhibition, the exhibition of Turner Watercolours and oils and possibly to visit the retrospective of all the past years of the Turner Prize. The main "Turner Prize" is being held this year in the Tate Liverpool to celebrate that city being the "European City of Culture" for 2008. 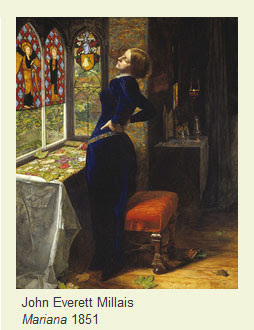 Millais to give you the quick summary. Child prodigy, ultra-meticulous painter until after the age of 30 after which he loosen up and did good work. Married Art critic John Ruskin ex-wife after she divorced Ruskin on grounds of 'non comsumation'. This as you might imagine caused quite a stir in Victorian England. The Turners were as they always are interesting and intriguing. I have seen a good few hundred of his watercolours over the years. He did leave over 30,000 works mainly drawings and watercolours to the nation. 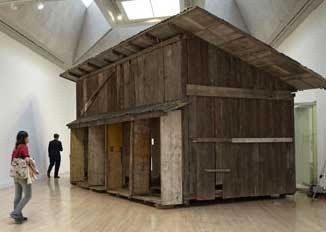 The Turner Prize review - not worth the extra £4 ($8) on the ticket. So we gave it a miss. When it was £1.50 ($3) then we would go for it. Don't get the idea that I am anti "modern art". The winners of the prize deserve much credit but I do tend to feel that they should be winning the prize for persuading some collector or institution to pay them large sums of money. The people who sold the emperor his "new clothes" must be some of the greatest salesmen going and should be recognized as such. Their "art" objects are of course irrelevant to all this. We did get to see again Shed - Boat - Shed which won in a previous year and was too big to fit in the "pay-and-view" area. Shed - Boat - Shed is an old shed that was spotted on the banks of the river Rheine (by a British 'Artist') taken apart and turned into a boat. 'Sailed' down the river for a bit and then turned back into a Shed. Last time we saw it you could go in and experience the vibe of being 'in an old shed'. This time such an experience was not considered to be part of the "art" and so a sign saying "Private", in German and English had been put on its entrance.